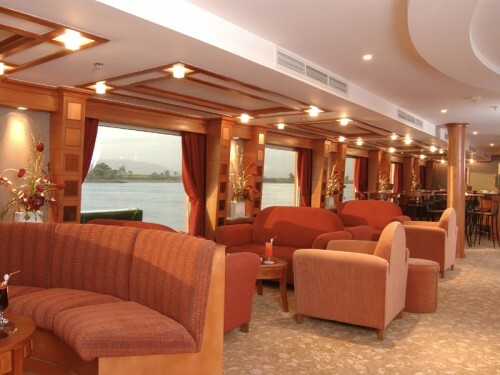 MS Zen Mojito Nile Cruise is a five star river Nile cruise. MS Mojito Nile Cruise offers you a comfortable cruising for the experience of a lifetime, takes you there to explore the mysteries of the Pharaohs between Luxor & Aswan with thrilling tours and shore excursions in Upper Egypt to Luxor treasures, Kom Ombo, Edfu and Aswan highlights. It consists of 4 decks including 70 suites with 21 m2. The MS Mojito Nile Cruise launched 2005. It consists of 69 junior suites (Including 2 singles &15 large beds) plus 1 presidential suite. All suites are on upper decks except 6 on lower deck. All are outside with large bay windows with one section that can be opened.